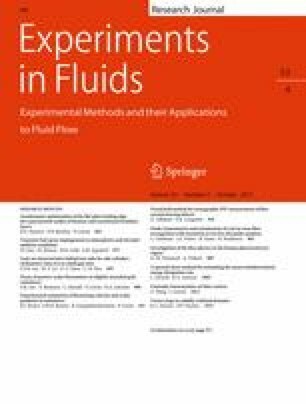 A three-dimensional (3D) particle image velocimetry measurement technique capable of simultaneously monitoring 3D fluid flows and the structure of an arbitrarily moving surface embedded in the flow was proposed with a heavy emphasis on image processing methods. The costs associated with the experimental apparatus were reduced by recording the surface and the trace particles at one image plane without the use of additional cameras or illumination devices. An optimal exposure time for surface and particle imaging was identified using red fluorescent tracer particles in conjunction with a long-pass glass filter. The particle image and surface image were then separated using an image separation process that relied on the feature scaling differences between the particles and the surface texture. A feature detection process and a matching process facilitated estimation of the 3D surface points, and the 3D surface structure was modeled by Delaunay triangulation. The particle volume reconstruction algorithm constrained the voxels inside the surface structure to zero values to minimize ghost particle generation. Volume self-calibration was employed to improve the reconstruction quality and the triangulation accuracy. To conserve computing resources in the presence of numerous zero voxels, the MLOS-SMART reconstruction and the direct non-zero voxel cross-correlation method were applied. Three-dimensional experiments that modeled the flows around an eccentric rotating cylinder and a flapping flag were conducted to validate the present technique. This study was supported by the Creative Research Initiatives (No. 2012-0000246) program of the National Research Foundation of Korea.